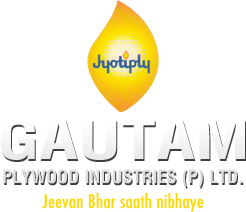 The Foundation stone of company, Gautam Plywood Industries (p) Ltd. was laid in the year 1995. The company has shown great results under the guiding light of veteran professionals and other experienced team members. Our factory equipped with latest machinery, is located in Distt. Rohtak (Haryana) and is staffed with a team of qualified and wise technicians. Due to quality, our material is well known between Architects, Interior Decorators, Engineers and Contractors. All leading architects specified our material in their projects. We procure raw material i.e. timber, core, veneers, chemicals etc. from the best sources. We follow a very rigid Quality Control System at every stage of production. Quality of our products not only confirms to the standards prescribed by Bureau of Indian Standards (ISI) but even exceed them by miles.